1965 would be the last of the "Letter" cars until being re-invented in the 1999 M series. Nearly every feature of the 300 L either standard or optional was made available on the non-letter 300s thus minimizing the necessity of a separate model line. Nevertheless, the standard 413 cid V8 with 390 bhp in the 300 L resulted in good performance. 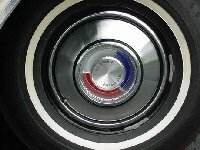 The only truly unique feature of the 300 L was a medallion at the center of its silver crossbar grille which glowed softly at night when the headlights were turned on. Despite minimal differentiating features, the 300 L enjoyed the second highest sales of any 300 Letter car. But this wasn't enough as Chrysler� decided to cancel plans for a 300 M. The 11 year run of the 300 Letter cars officially ended after 1965. 300L SERIES - (V-8) - This was the last year for the letter series high-performance specialty car. It closely resembled the standard 300 Series. 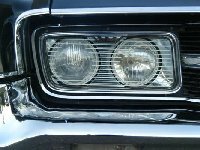 The letter 'L', in the center of the grille cross bar, was designed to light up when the key was turned on. However due to some state laws, many were delivered so the grill only lighted up when the lights were turned on. The 300L used high-performance tires and suspension, coupled with a high-output 413 cubic inch single carburetor engine, to set it apart from the regular 300. 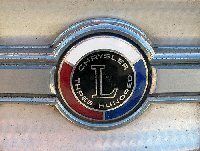 Styling touches used to distinguish the Chrysler 300L were a painted insert in the upper body molding and a damascened insert between the rear tail lamps, as well as special interior appointments and the appropriate letter series medallions. 300L SERIES I.D. NUMBERS: Serial Numbers and Engine Numbers were located as on previous series. Detroit built units began with C453-100001 and up while Delaware built cars began with C456-100001 and up. Engine prefix began with A-413 and then the date code. 30OL's also had an 'HP' stamped on the block, alongside the date code. V-8. Overhead valves. Cast iron block. Displacement: 413.8 cubic inches. Bore and stroke: 4.188 x 3.75 inches. Compression ratio: 10.0:1. Brake horsepower: 360 at 4800 R.P.M. Five main bearings. Hydraulic valve lifters. 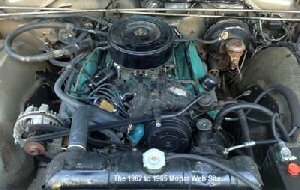 Carburetor: Carter Type AFB four-barrel Model 3860S. CHASSIS FEATURES: Wheelbase: (Newport, 300, New Yorker) 124 inches; (Town and Country station wagons) 121 inches. Overall length: (Newport, 300, New Yorker) 218.2 inches; (Town and Country station wagons) 218.4 inches. Tires: (Newport, 300) 8.25 x 14; (New Yorker, 300L, Town and Country) 8.55 x 14. POWERTRAIN OPTIONS: Three-speed manual transmission was standard in Newport and non-letter 300. Automatic transmission was standard, in New Yorker and 300L models. Automatic transmission was optional in Newport and non-letter 300s. Four speed manual floor shift, transmission was optional in Newports, 300s and 30OLs. V-8 383 cubic inch 315 horsepower four-barrel engine in Newports. 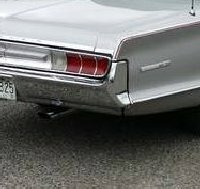 V-8 413 cubic inch 360 horsepower four-barrel engine in 300s.and New Yorkers., Positive traction rear axle was optional in all models at extra cost. CONVENIENCE OPTIONS: Power steering (Newport, 300). Power brakes (Newport, 300). Power windows. Power seat. Reclining bucket seats. Power door locks. Heater and defroster. Air conditioning (dual air conditioner all except convertible). Golden Tone radio. AM-FM radio. Golden Touch tuner. Rear seat speaker. Console (300). Seat belts. Heavy-duty springs, shocks, sway bar and brakes (300). Adjustable steering wheel. Undercoating. Tinted glass. Day/Night rear view mirror. Remote control mirror. Leather upholstery. Historical footnotes: Last year for letter series 300s. Chrysler built more than 200,000 cars for the last time ever. Last year for 413 engine.